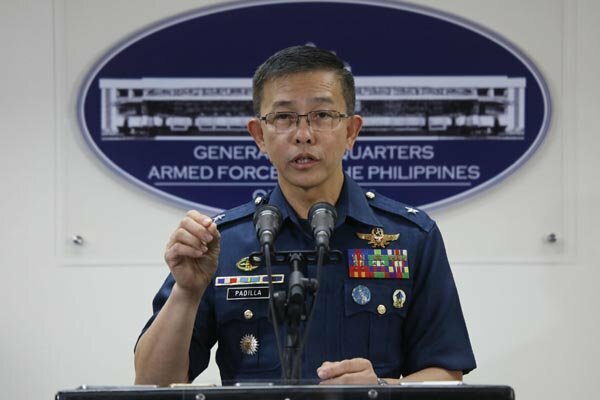 MANILA, June 27 -- The decision of local religious leaders to negotiate with Maute Group terrorists regarding the release of certain hostages is not sanctioned by the government, said Armed Forces of the Philippines (AFP) spokesperson Brig. Gen. Restituto Padilla on Tuesday. He issued this statement in wake of reports claiming that Abdullah Maute, one of the leaders of the lawless elements responsible for wrecking havoc in Marawi City, is open to swap Father Chito Suganob in exchange for the release of his parents, Cayamora and Ominta "Farhana" Maute, who were arrested earlier this month. "Government's policy not to negotiate with terrorists remains. Hence, the local religious leader led talks with the terrorists last Sunday is one that was not sanctioned by government, the military and our political leaders," Padilla said. "Any demands made inside therefore hold no basis. Let us continue to remind the public that the gravity of their (terrorists and their supporters) offense is immense and they must all be held accountable for all their actions," the military official stressed. Conflict in Marawi City started when government security forces attempted to arrest Abu Sayyaf Group leader Isnilon Hapilon, the ISIS "Emir" in Southeast Asia, last May 23. As of this posting, the number of terrorists neutralized by military operations are placed at 290, with the number of government troops killed in action at 70 and 27 civilians executed. Number of firearms recovered from the lawless elements are placed at 347 with the remaining hostages placed at 150 to 200.